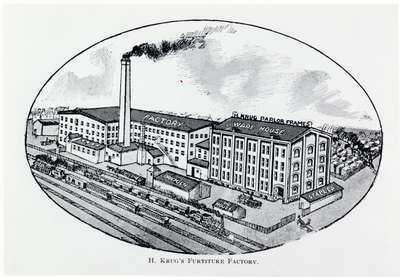 Black and white, oval-shaped, photographic copy of lithograph showing H. Krug's Furniture Company factory, with parts of the factory labeled. The H. Krug Furniture Company was founded in 1887 on the corner of Ahrens and Breithaupt Streets in Berlin, Ontario, by Hartman Krug. The company initially produced frames, dining rooms sets, and rockers, but by 1908 production included all types of furniture, with a specialty in chair-making. The word "furniture" is spelled incorrectly in title on lithograph. Please see P007081, P007082, P007083, and P007084 for H. Krug Furniture Company factory photographs.